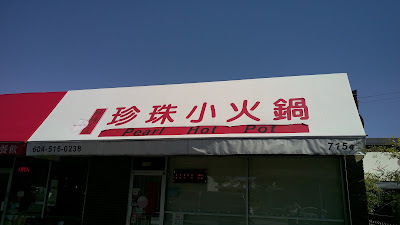 I have been visiting this hot pot joint in Burnaby since my early teens. Honestly, other than new coats of paint, new layers of laminated table tops and new utensils/dinnerware, nothing has changed much. Same ownership. Same selections. Same offerings. Okay, I lied...it's not really the "same" offerings as back then. 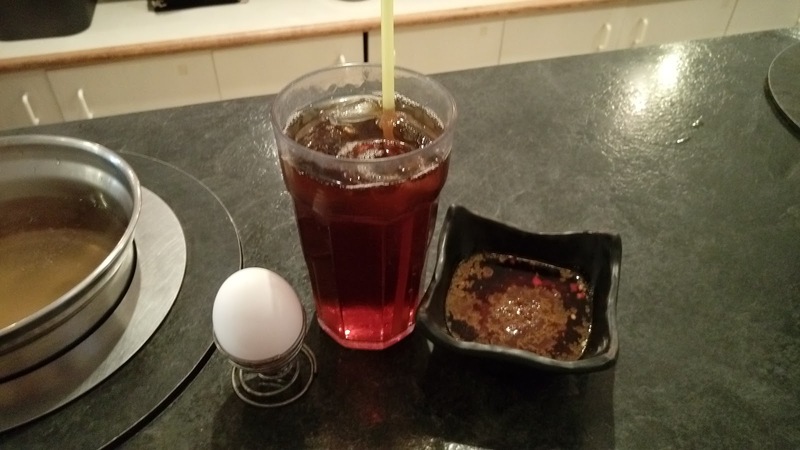 The tea drink that's included in the combo package used to be bottomless and the meat used to be bigger portions too. 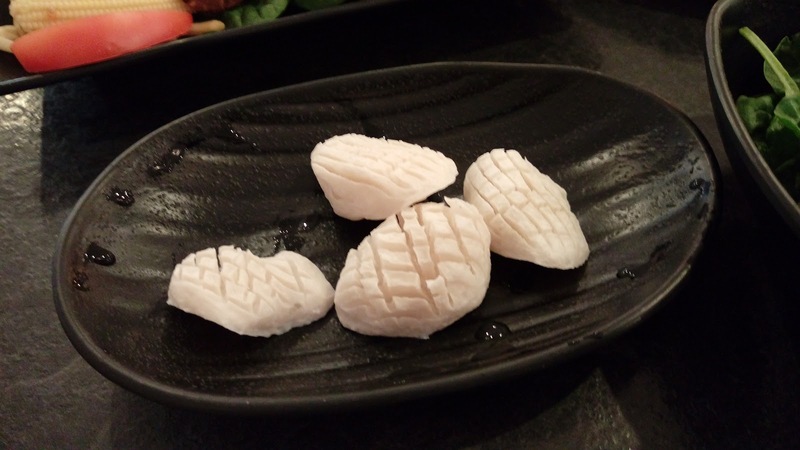 This is not an AYCE joint. 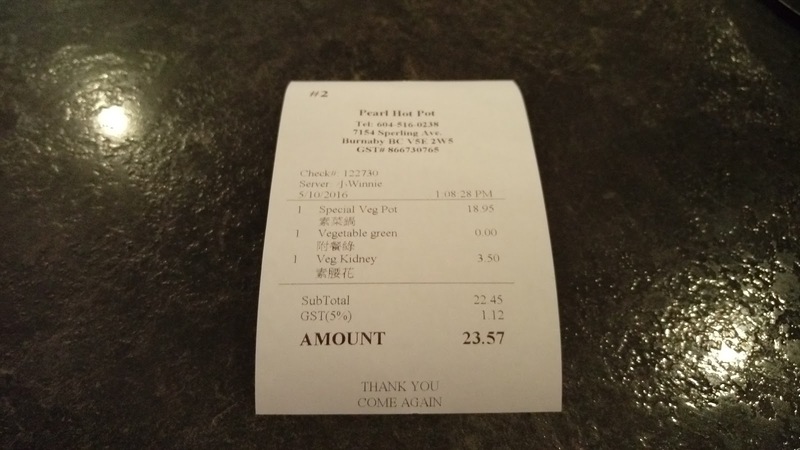 Each customer is required to order a pot combo as the minimal charge. 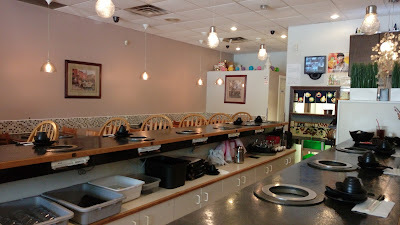 Combo prices vary depending on the type of meats and each combo comes with a pot of clear broth, raw egg, assorted vegetable platter, choice of rice/udon/vermicelli, dipping sauce (garlic, scallion, sa-cha sauce, soy sauce, chili), one glass of sweetened black/green/fruit tea and soft-serve ice cream. Since my two recent visits were only three days apart, I decided to combine the two under one post. My first recent visit was on my vegetarian day. 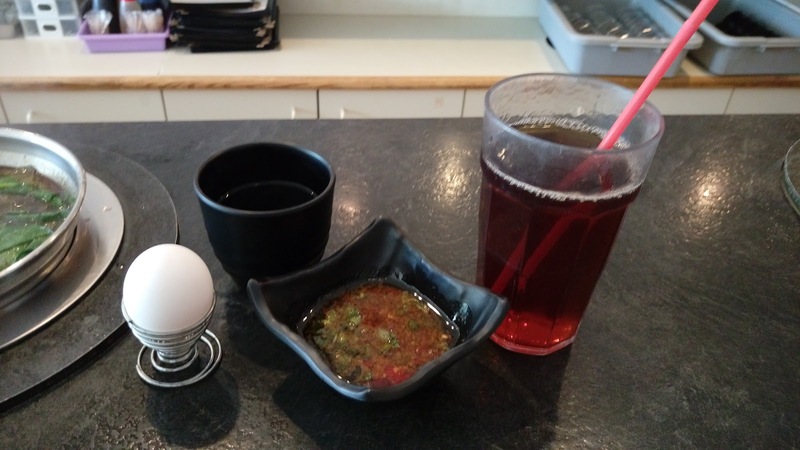 I ordered the Special Vegetarian Pot 素菜鍋, which came with a vegetarian soup base made quickly by adding water to the vegetarian broth concentrate. The concentrate can be found at Guo-Hua 國華 in Richmond or at any T&T Supermarkets 大統華. 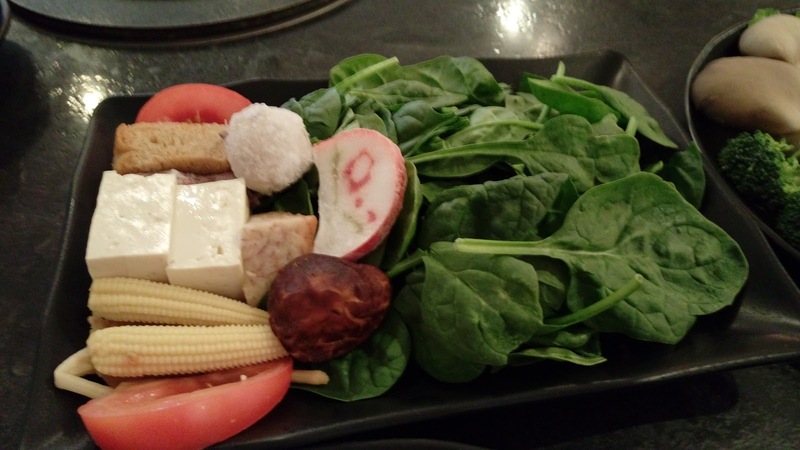 The assorted vegetable plate usually comes with napa cabbage, but due of my dietary restrictions, I have requested to change it to seasonal greens (in this case, it was spinach). 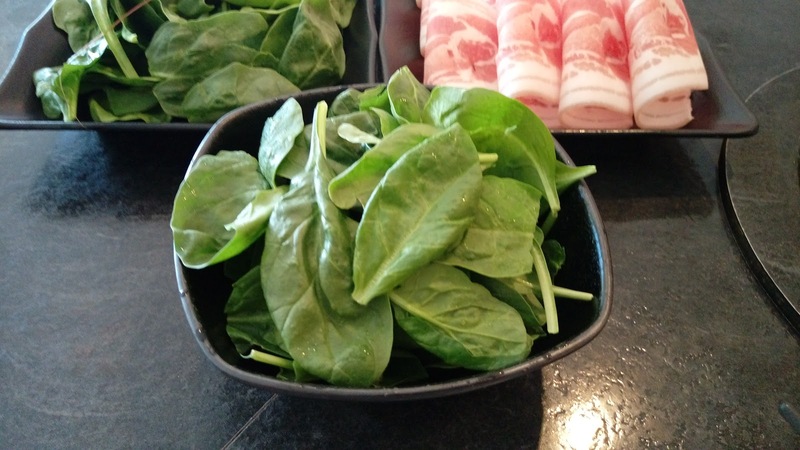 And since I don't usually eat carbs when I do hot pots, I requested to have seasonal greens instead of rice/udon/vermicelli. 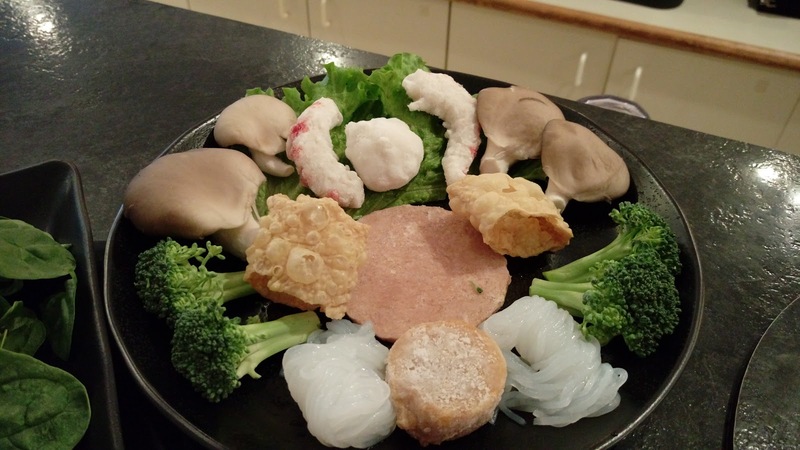 I have also added an order of Vegetarian Kidney 素腰花. 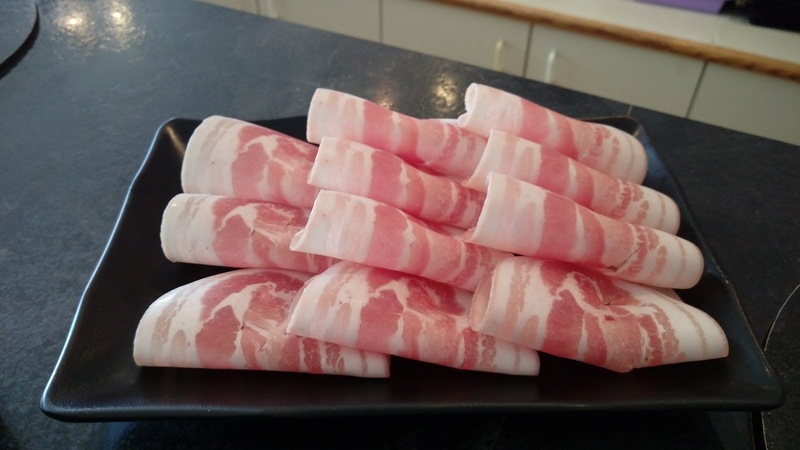 On my second recent visit, I ordered my usual combo of Bacon Pot 培根豬肉鍋. 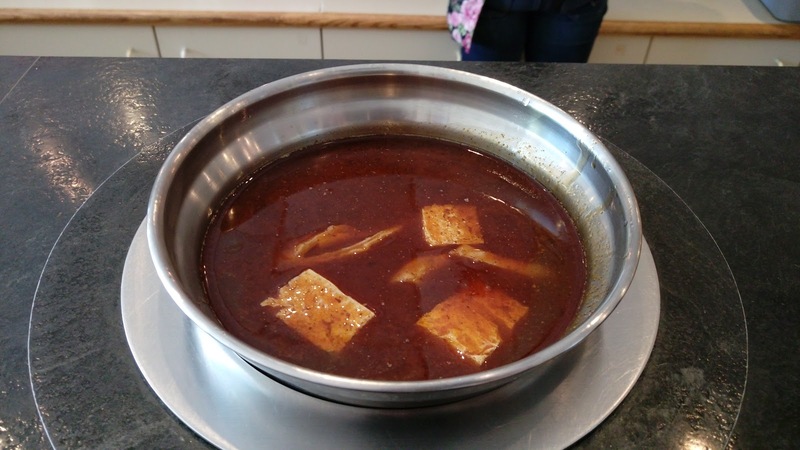 I paid extra to change my clear broth to Spicy Pot 麻辣鍋底 which includes pork intestine 肥腸, iced tofu 凍豆腐, pork blood 豬血 and preserved sour vegetable 酸菜. 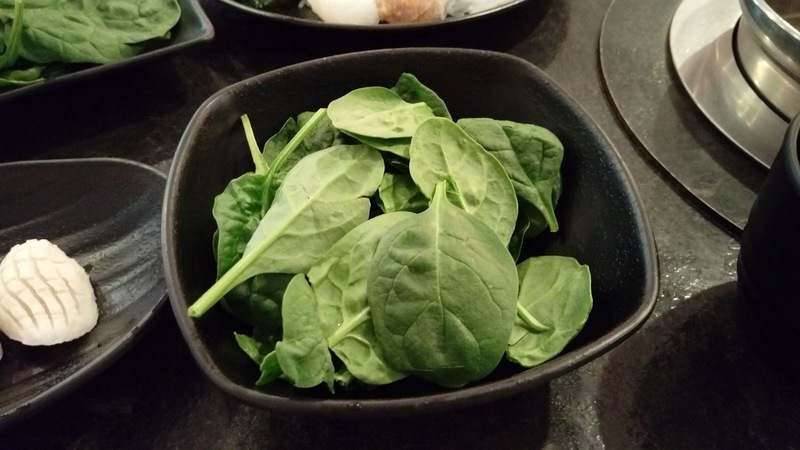 Again, I requested to have seasonal greens instead of carbs. 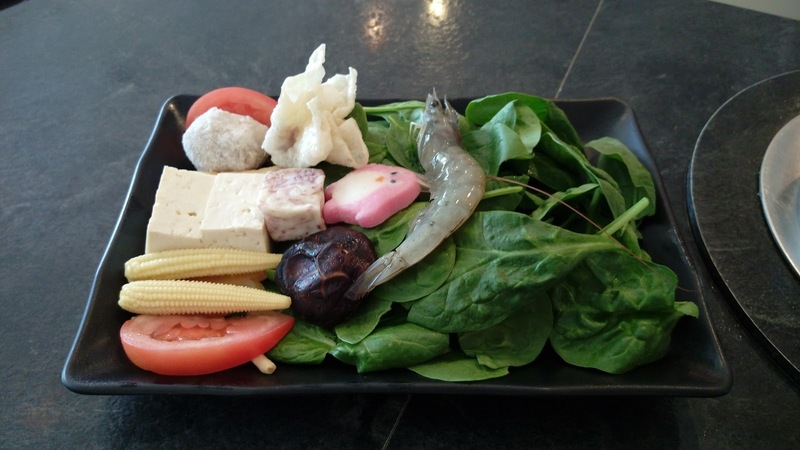 Napa cabbage was also changed to seasonal greens in the assorted vegetable plate. The plate also had a shrimp, a house-made pork wonton and a pork meatball. 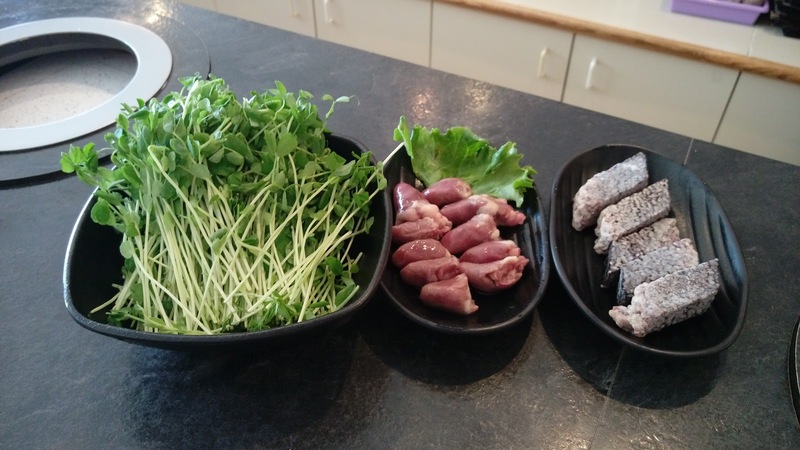 On top of the combo, I also added Bean Sprouts 豆苗, Chicken Hearts 雞心 and Sticky Rice with Blood 豬血糕. Ice cream was served at the end of the meal when bill was requested. 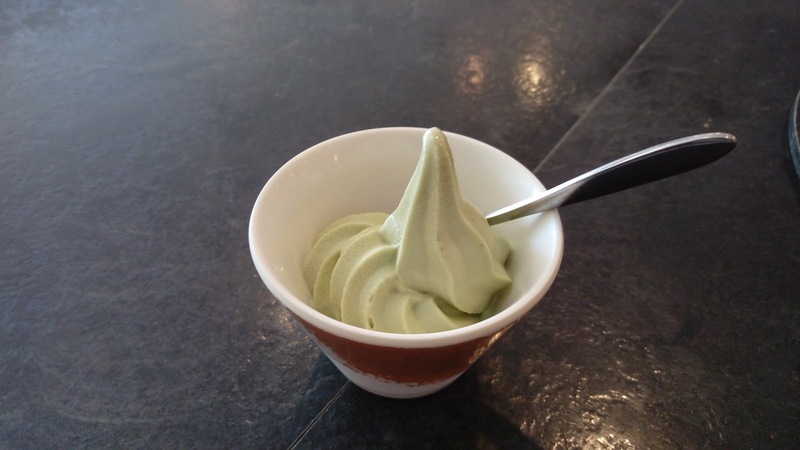 On both visits, green tea and mango were the two available flavors. The green tea soft-serve was very weak in its flavor. The mango ice cream, on the other hand, had a strong canned mango sweetness. 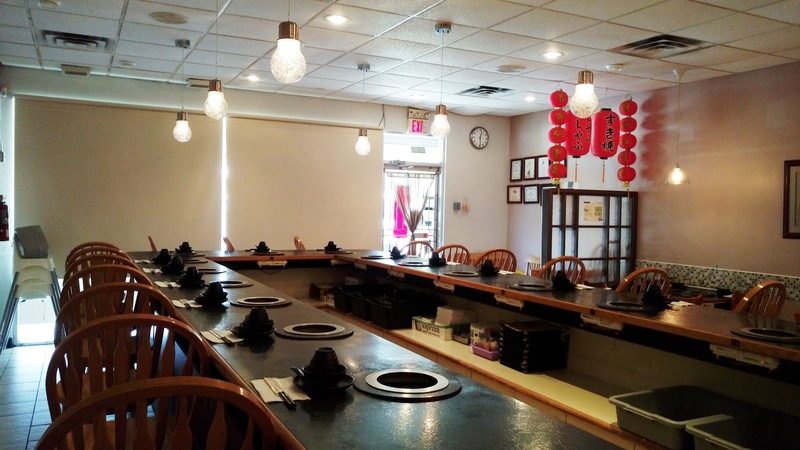 Do not come here if you are a big eater and/or you love AYCE. You will complain and grumble all the extras you will have to pay. 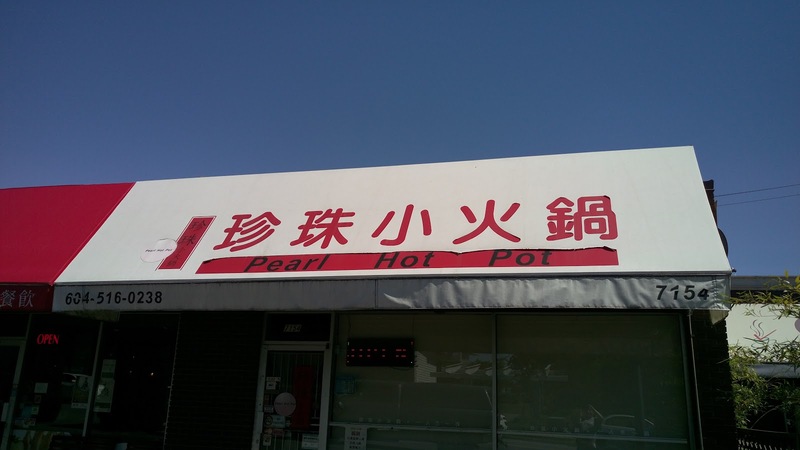 If you are a small eater and/or prefer a simple hot pot combo that includes all the necessities with no time restrictions, than this place may be ideal for you. Did I mention that, other than the drink and the ice cream, you can also pack home whatever you cannot finish? 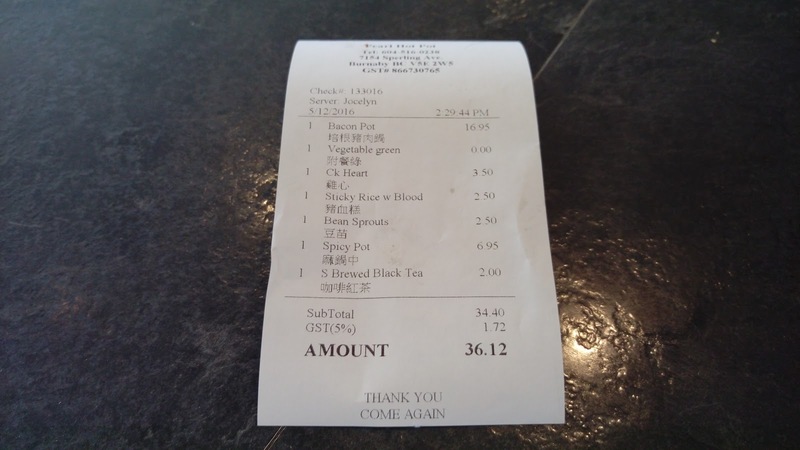 My bills, before tips, were $23.57CAD for the vegetarian meal and $36.12CAD for the regular meal. I was satisfied and I was full. 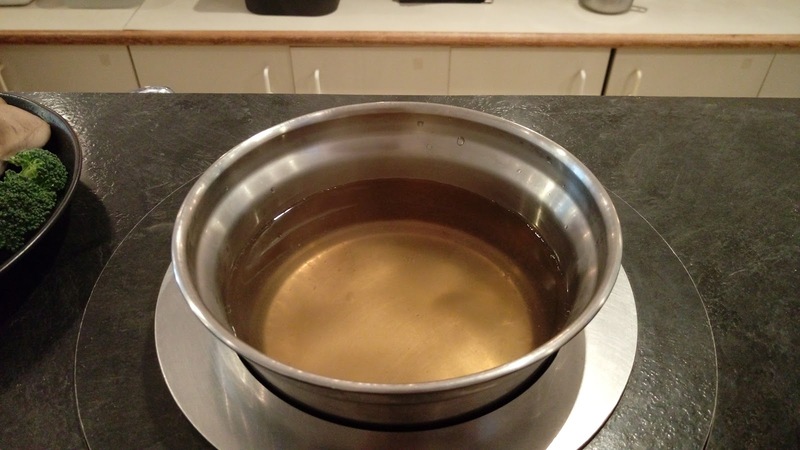 Now the service. I haven't visit this joint for at least a year so I didn't recognize any of the new faces. The old crew provided good service, but the new...well, let's just say this place really stretched it thin.